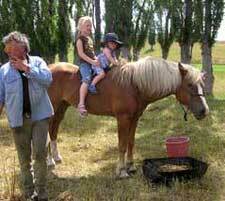 Travel to New Zealand & you will see Quietude Goldrush and his get compete against heavy draft horses. 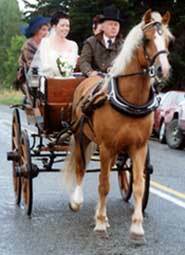 Goldrush also was driven to the church by his owner Peter Robson with his daughter, Gina, on her wedding day. Peter Robson and his team competed in a demonstration class of the 50th Mobil Silver Plough competition held on April 30th & May 1st in North of Oamaru at Pukeuri, The Morgan team was 3rd in this class to two part Clydesdale teams & achieved higher points than the leading Vintage Tractor combination. 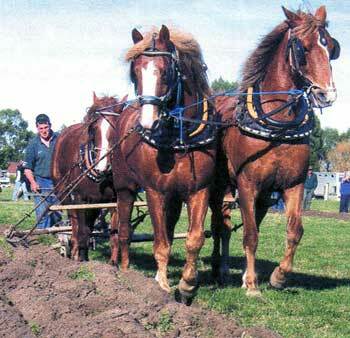 Competitors were allowed 3 hours to plough their 100 meter x 20 meter grass and stubble plot. Any slight diversion off the intended course would have spelled disaster. Judges allocate points for the other factors including the opening spit, tightness of the furrows, how much soil was available for crop, seedbed preparation & the finish. 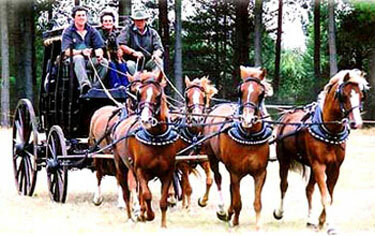 Peter is also involved in the tourist trade as he contracts to drive a team of 5 to a stagecoach. Horses in this photo from left to right are:- Quietude Goldrush, Armagh Britney, Armagh Rebecca, obscured is the Morab Armagh Billy. Brittney & Rebecca are full sisters (Quietude Goldrush x Mt Tawonga). Susan, Quietude Goldrush seems to thrive under pressure and loves the public attention. He has become the mainstay for leading the whole team through some very challenging situations. His owner is probably more stressed at the end of the day than Goldrush is!!! Peter and Jason, (our son), had a ball in Dunedin. The coach in the enclosed photo is a replica (which Peter built here at home), 1880 NZ Throughbrace stagecoach which was introduced at the time of the goldrushes in around that time. The coach weighs 960kgs empty and carries eight people including the driver. The hitch is locally known as a "pickaxe hitch," two britchin horses on the pole, three leaders hitched to an equaliser in the lead. Our best day so far was one hundred kilometres of road work. It would be a fantastic lifestyle if one could do it fulltime but unfortunately our small population base doesn't allow that. 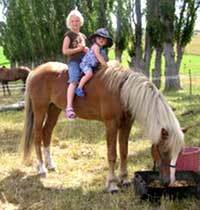 We are lucky in the fact that we have a very good line of horses that are adaptable to not just coach work but general agricultural work as well. They can take some settling down after coach work when they go back to ploughing as they do enjoy the freedom of gait of the coachwork. Hi Susan, Quietude Goldrush (Criterion the Younger x Quietude Sally Moro) and his progeny have just won the Reid and Grey Otago Cup for Heritage Ploughing. That, is they have beaten all heritage tractors over the season plus were second overall to all types of tractors including those heading off to the World Championship on Slavakia later this year. I've just been on your site and can't get over how much Quietude Jubilee Kingdom is like 'Jock'...They are so similar it is uncanny! On the 14th and 15th of April 2007 Peter Robson with his Morgan, Quietude Goldrush (Criterion the Younger x Quietude Sally Moro) and Goldrush's get, Becky, Billy and Brittany won the Silver Plough Competition for horses again this year. Last year they went to Oxford and beat teams of Clydesdales and others and this year at Mataura they competed with four other teams to win the trophy again. from one end of New Zealand to the other--the long way! 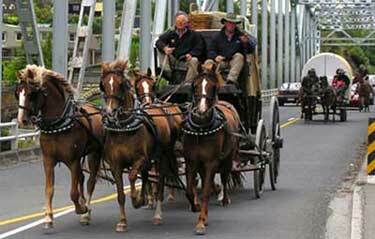 WILD WEST WAGON: The Southern Wagon Horse Power group arrived in Waimate yesterday. The group are raising money for Dunedin's rescue helicopter. A cavalcade traveling from Bluff to Picton over eight weeks is raising money for a much faster form of transport  a helicopter. 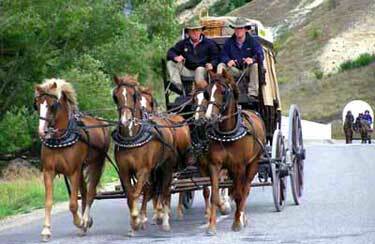 Yesterday the Southern Wagon Horse Power group arrived in Waimate, after traveling from Kurow in the morning, and their journey is expected to be the longest stagecoach trip in New Zealand. Co-organizer Ellwin Cowie said the group were traveling wild west wagon-style to raise money for Dunedin's rescue helicopter. "We talked about the idea with other wagon enthusiasts two years in a row at the Otago Goldfields Heritage Trust Cavalcade. Last year we decided we would organize it and go in 2007 and formed the Southern Wagon Horse Power group. "It's quite a relaxing way to travel, a nice slow pace. We are sleeping in the wagons, wild west style." Twenty-two people, five wagons, and 35 horses left Bluff on January 20. Some of the participants have leave from their job while some have had to quit. "This is a once in a lifetime trip so people have done what they can to be involved. "So far 99.9 per cent of the drivers have been fine and slowed down as they approached us." There had been a few sore backs, but these were caused by a car crashing into the back of one of the support cars. The group had been overwhelmed by the support, sometimes drummed up by one member driving ahead and knocking on doors. 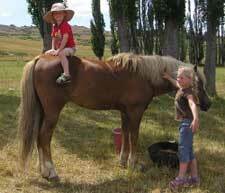 "We have just asked if we can stay there so the horses have somewhere to rest and be washed. We are figuring it out as we go along." The cavalcade will spend a few days in Waimate and plans to be at Salt Water Creek on Monday, and then Cave, Pleasant Point and then three days in Geraldine. "It is all dependant on weather and the horses. We are in no rush." It has been a long ride for Southlander Peter Robson, and there is a fair bit of country ahead of him yet. 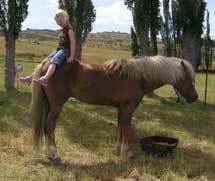 Robson is from Lochiel, near Winton, but has been passing through Canterbury in the last few days. 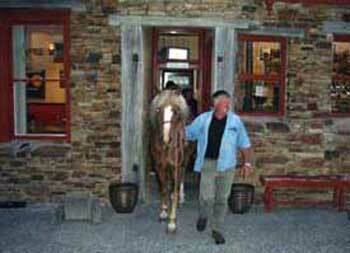 He is part of a 37-horse, five-wagon team traveling from Bluff to Picton to raise $50,000 for the Lion rescue helicopter. The wagons left Bluff on January 20. Robson, a wheelwright, said the fundraising trip was agreed on over a few drinks during an earlier cavalcade, and, as the Lion helicopter had rescued people from cavalcades, they decided it should get the money. Nearly $5000 has been raised, with $800 coming from Geraldine. Robson, who built his own coach and has orders for more, said the trip was no picnic, with riders rising at 5am to feed the horses and prepare for another day on the road. He said the tar seal was hard on horses, with some shoes wearing out in days. On cool days the wagons could cover 60km to 70km, he said, but much less as the sun heated the seal. 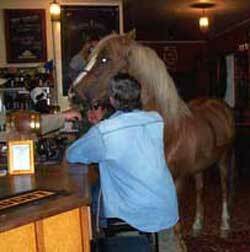 Robson said his horses, Morgans, were on hard feed  chaff, molasses and brewer's yeast, among other things. Robson's coach is new but based on an 1820s design and took him six or eight months to build, "When I should have been doing other things".